It was a perfect day for a ride yesterday so I took my bike to Niagara Falls. 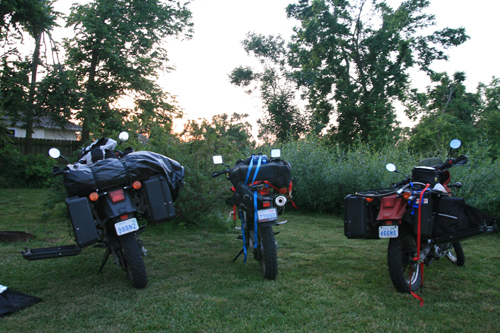 You can see some of the recent mods: the Happy Trails panniers, Clarke gas tank, and Corbin seat. I took the back roads, finding some scenic rides along the Niagara escarpment (including some dirt), and clocked over 400 kilometres. I am impressed with the Corbin. With the stock seat, I would have had difficulty walking after such a ride. I had seen the Falls once when I was very young, and I was worried that I would be disappointed seeing them as an adult. I was wrong – if anything the Falls were even more impressive than I remembered. I have lived in Toronto since the start of the school year in 2006, but this is the first time I have spent any time in Toronto in the month of June. For the past two years the start of June has been marked by a grand departure on a 3 month motorcycle adventure. On this day In 2007, Ted, Tom, and I were camping just outside of Springfield, Missouri as we followed route 66 across the United States on our way to Mexico and beyond. The night before we had camped in a pubic park in St. Louis, and the night before that we had camped in a public park next to Lake Michigan just south of downtown Chicago. Three months later Ted and I would arrive in Buenos Aires, Argentina. Above: On June 5, 2007, we camped at a KOA just outside of Springfield, Missouri. It was the first shower/laundry day since we had left Toronto on June 2nd, and the first time we had actually paid for camping. On this day in 2008, Tom, Jerry, Ted, and myself were camping in the forest near Heilbronn Germany, already well into the Europe leg of our London to Cape Town Adventure. We had spent the day following the River Rhein as it cut a dramatic swath through a deep lush valley with castles perched on the ridges. I remember being mesmorized by the scenery for the first time since we had left London on June 2nd. 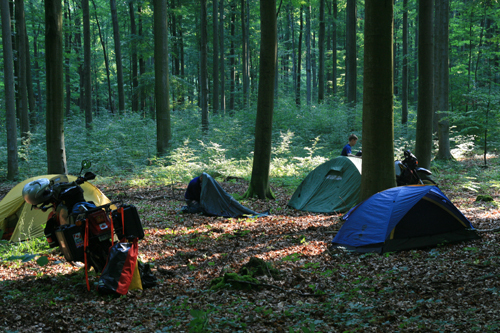 Above: On June 5, 2008, we camped (for free) in a wooded area in Southern Germany. The night before we had camped (for free) on the outskirts of Bonn, and the night before that we had camped (for free) in the parking lot of the Westvleteren brewery in Belgium (where the world’s best beer is brewed by the Trappist monks of the Abbey of Saint Sixtus). I guess it is only natural for my wanderlust to be particularly acute at this time of year. I am in serious adventure withdrawal, yearning to hit the road. There is so much of the world I have yet to see. I sorely miss the freedom of the open road and not knowing where the day’s ride will take me or what wonders I will experience along the way. Ted Simon, who rode his Triumph around the world for 4 years in the 1970s (and is the author of one of my favourite books – Jupiter’s Travels) once talked about the difficulty of returning to a “normal” life after his epic motorcycle adventure. He described how he felt trapped by a “multitude of gossamer strands” imprisoning him. That sounds a bit extreme to me, yet I can definitely understand where he was coming from. Nothing forces you to live in the moment and gives you a sense of freedom like crossing some exotic corner of the world by motorcycle, exposed to the elements, with no clear idea of where your next meal will come from or where you will spend the night. It seems that the closest I will come to adventure this June is to re-read my journals and live vicariously through myself. Bah.